Lisa Su, AMD’s CEO, revealed that Carrizo will deliver the largest ever generational leap in performance-per-watt for mainstream APUs. In addition Su also confirmed that Carrizo will be launched in the second quarter of the year. Previously the company had stated that the new APU will launch sometime in mid 2015 which includes Q2 and Q3. So the recent concise timing revelation indicates that testing, evaluation and qualification of the next generation part are going swimmingly. Carrizo is AMD’s last APU based on the Bulldozer family of CPU cores. The APU will feature AMD’s latest iteration of that microarchitecture code named Excavator. It will also feature an updated graphics core next, GCN for short, GPU architecture. 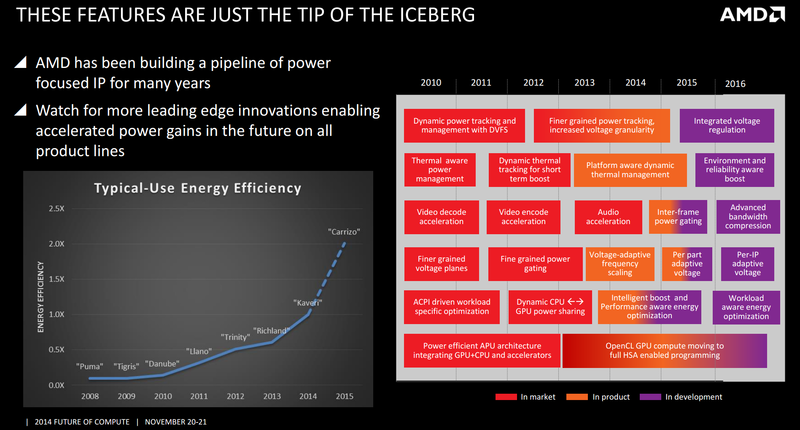 Carrizo will be the first evidence of AMD’s previous promise of improving power efficiency of its processors by 25 times within the next five years. We plan to introduce a strong 2015 product portfolio, punctuated by the launch of Carrizo in the second quarter. Consumer and commercial design win momentum for Carrizo continue to gain momentum because it will deliver the largest ever generational leap in performance per watt for our mainstream APUs. So we are enthusiastic about our Carrizo launch that will take place in the second quarter. I think if you look at, you know, the improvements that will come with that, HSA is one of them. We’ll also have significantly improved performance in battery life in Carrizo. Carrizo brings all of the aforementioned improvements while maintaining the same 28nm SHP Globalfoundries manufacturing process used for Kaveri. Not only that but according to eetimes.com Carrizo also maintains the same die area as Kaveri. This underlines that these improvements are a result of true innovation rather than traditional generational gains due to a more advanced manufacturing node. Some of the new innovations have already been revealed by AMD. Among them is full HSA (Heterogeneous System Architecture) 1.0 compliance. When it’s ratified, Carrizo will be the first ever SOC to have full HSA support. Its predecessor, Kaveri, only supports essential features of the standard and isn’t compliant with all of HSA’s specifications. 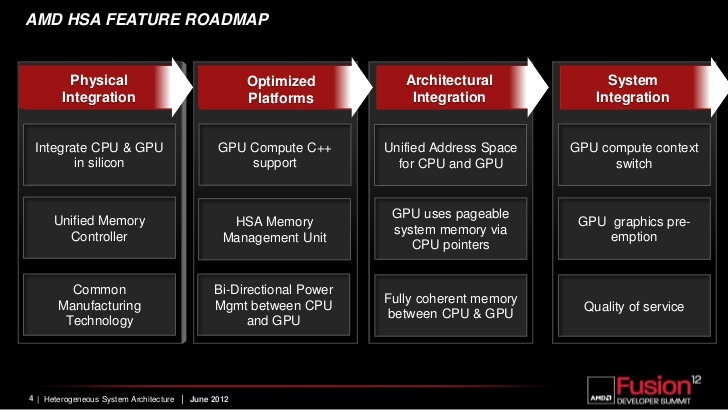 The evolutionary improvements of AMD’s fusion roadmap can be seen in the image below. Carrizo finally delivers the last requirements for full HSA support. In the more traditional performance improvement sense Carrizo will carry noticeably higher clock speeds than its predecessor within the same given power envelope. This is in addition to the performance improvements gained by the new CPU and GPU cores. The improved clock speeds are partially thanks to a new intelligent voltage management technology that allows AMD to reduce the voltage required to reach the desired frequency. This is achieved by feeding the SOC just enough voltage for the target frequency and then reducing the frequency momentarily when voltage dips occur to maintain system stability. To understand why this is so effective one must look at how voltage typically behaves. 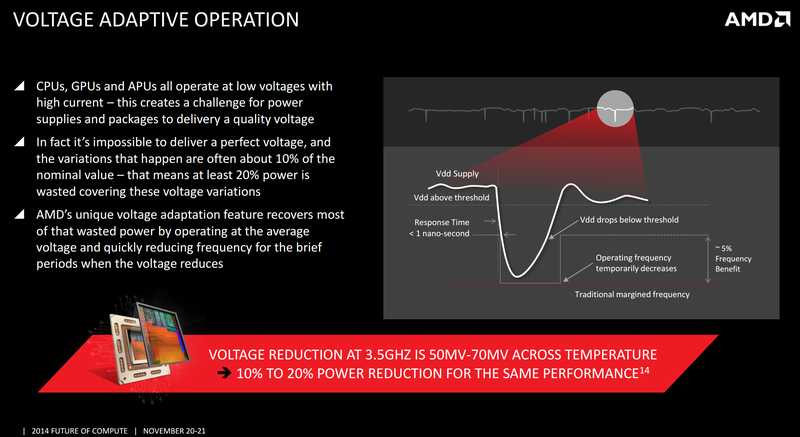 It’s impossible to deliver a perfect voltage that doesn’t dip or spike. So what engineers have traditionally done to ensure system stability is account for the voltage dips by increasing the voltage delivery to the SOC by an equivalent margin. For example if we know that our voltage delivery of 1.25v typically dips to 1.245v we feed the device 1.255v so that when it dips it doesn’t go below 1.25v. This is to account for the voltage drop that would otherwise cause system instability. What the AMD engineers have done here is feed the SOC 1.25v and implement a very precise voltage monitoring mechanism. So that when the voltage dips to 1.245v the system would recognize that and reduce the frequency for a very brief moment in which that dip occurs to maintain system stability. The result is a 15% improvement in performance for a given voltage. Essentially a 15% improvement in performance per watt. Furthermore, recent performance benchmark leak points to a doubling in graphics performance from Kaveri to Carrizo. Allowing Carrizo to deliver the same performance of the APU inside the Playstation 4. Naturally, AMD can’t confirm the validity of these benchmarks as Carrizo hasn’t be released yet. Synthetic benchmarks also don’t tell the whole story but never the less if AMD comes close to delivering similar performance to the next, now current, generation of consoles inside a 45-35W power envelope, that would be an extraordinarily impressive feat. Carrizo brings revolutionary efficiency improvements on evolutionary CPU and GPU architectures. These innovations in efficiency thankfully can be implemented in any future processor by AMD, whether it was a CPU, GPU or an APU. So the prospect of seeing these innovations implemented in more competitive CPU, GPU and APU products based on AMD’s upcoming next generation x86, ARM and GPU architectures in 2016. Leaves us with even more excitement in anticipation of what’s to come.